A much-anticipated decision on whether or not to extend Sunday trading hours in Belfast has been deferred for one week. Councillors, trade union representatives and other stakeholders had gathered at a meeting of Belfast City Council’s Strategic Policy and Resources Committee on Friday morning and a vote was expected to be held on the issue. 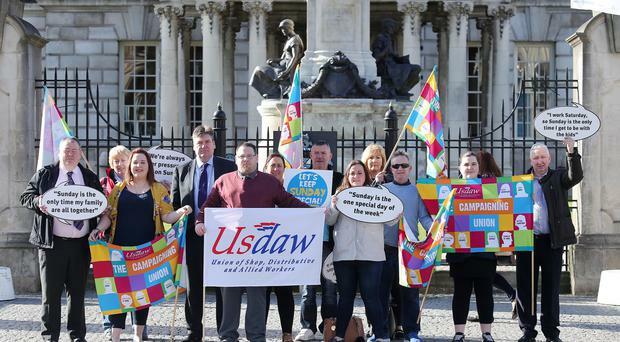 Following representations from trade union Usdaw, Retail NI and others, however, Sinn Fein councillor Deirdre Hargey proposed the decision be deferred one week to allow parties to obtain more information on the matter. Other committee members agreed and the proposals were set aside to be considered at a later date. Prior to the meeting getting underway at City Hall, members of the trade union Usdaw gathered outside to protest against extending the hours. Inside the building, Usdaw Divisional Officer Michael Aylward made his case to councillors that they should “give retail workers a break” and vote against the proposals. “I’m disappointed that this issue is back on the agenda,” Mr Aylward said to the committee. "Just see this through the eyes of a shop worker. These are real people with real jobs, who have real issues and family concerns. Retail NI boss Glyn Roberts warned that, if BCC votes in favour of extending Sunday trading hours, other councils could follow suit. “This would set a dangerous precedent that will unravel. Other council’s are looking at this issue and the way this committee votes on this,” he said. Arguing in favour of the proposals was Hospitality Ulster Chief Executive Colin Neil, who said extending Sunday trading hours would be an opportunity to “maximise tourism in Belfast and surrounding towns”. Gerry Lennon of Visit Belfast said a vote in favour would help Belfast achieve its tourism goals, as “retail is an important part of creating a vibrant city”. Friday’s discussion followed one committee vote and two public consultations on the issue in the last 12 months. Several councillors said they needed to see more concrete figures and statistics on the merits of extending Sunday trading hours. On Friday, councillor Hargey said her party needed more time to consider issues relating to workers rights and a possible charter insuring such rights would be protected in the event of the trading hours extension. DUP Councillor Lee Reynolds said his party couldn’t be asked to consider a charter for workers when they were provided with no details of it. “There is not one single piece of information that provides any basis for us to change our decision from the last vote,” he said.